United States President Donald Trump has promised more than 700 kilometres of new wall along the southern US border, after threatening to slap Mexico with economic penalties over what he describes as a crisis of illegal immigration and drug trafficking. 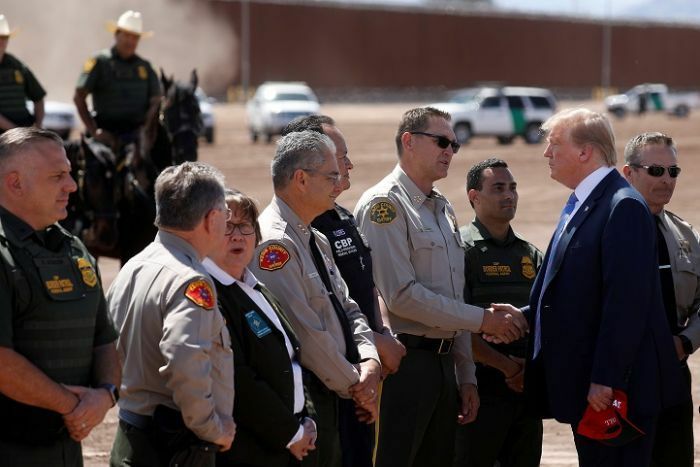 Referring to a “colossal surge” of undocumented migrants, Mr Trump convened a discussion with immigration officials and local leaders in Calexico on the US-Mexico border just north of the much larger city of Mexicali. 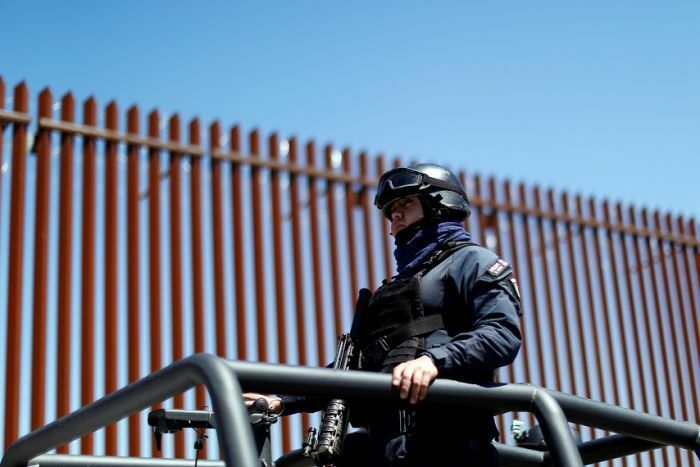 Before touring a just completed nine-metre-tall, 3.5 kilometre barrier at Calexico, Mr Trump said more military resources would be dispatched to the border. “Our country is full,” Mr Trump said, in a warning to would-be migrants. The Republican President’s latest pronouncements were in response to a rising number of migrants traveling northward from Central America through Mexico and to the US border. Mr Trump is counting on seizing funds from other federal accounts and shifting them for the construction of about 725 kilometres of new barrier — a move being challenged in Federal Court because Congress has not given approval. Democrats generally oppose Mr Trump’s wall proposal, suggesting alternative types of enhanced border security that they argue would be more effective and less costly. Hammering on a favourite theme, Mr Trump said he was considering imposing an unspecified economic penalty on Mexico unless it helped alleviate the United States’ drug and immigrant flows. Praising Mexico for moving recently against drug traffickers, Mr Trump said: “If they continue that, everything will be fine. If they don’t we’re going to tariff their cars at 25 percent”. “Also, I’m looking at an economic penalty for all of the drugs that are coming in through the southern border and killing our people,” he told reporters in Washington before departing for southern California. Mr Trump said the drug-related tariff would supplant provisions of a trade deal, the US-Mexico-Canada Agreement, known as USMCA, which has not been approved by Congress. In a Twitter post on Friday morning, Mr Trump repeated a threat to close the border if Mexico “stops apprehending and bringing the illegals back to where they came from”. The White House did not respond to a request for elaboration, and it also was unclear where Mr Trump got the $500 billion figure when referring to “illegal drugs that are shipped and smuggled through Mexico and across” America’s southern border. Previously, the Mexican Government freely handed out humanitarian visas with the goal of allowing people to stay and work legally in Mexico. But it backed away from that policy after a surge of those requesting the documents, and amid criticism from Washington.